Those damn envelopes. It all started with those three envelopes. 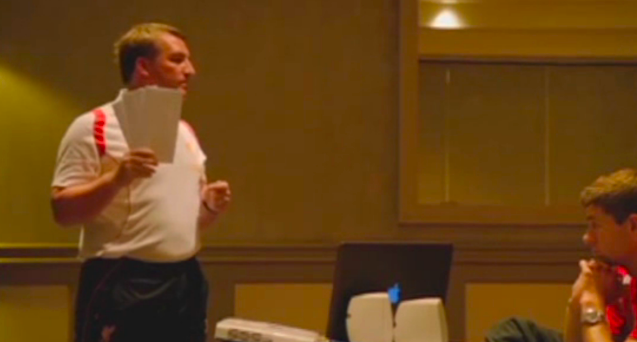 Brendan Rodgers put his Psychology 101 tricks in front of the camera and the David Brent style of management was born. He hasn't been able to live it down since. Even when Liverpool were on course to finally win the Premier League last year, the general consensus among fans was 'good manager, I just wish he'd feckin shut up'. But he's moved on from trying to scare players with empty envelopes. Letters from your mammy is the new way to go. In an interview with CNN, Philippe Coutinho has revealed that during the title run in last year, Rodgers would read letters from the players' mothers in an effort to gain an edge on their rivals. For Coutinho his turn came before the incredible 3-2 win over Man City that looked like it would deliver that all important league title. And, to be fair to Rodgers, Coutinho says it worked for him. I was so anxious for it to be my turn, for the manager to read the letter from my Mum. I waited and waited for it. The manager had spoken to the mothers of every player in the team, he'd been reading a message before every game for months and finally my turn had come. We were getting really strong, powerful words and it pushed us so much. Coutinho is a young player away from home and you can see why that would work but you have to wonder about some of the senior players. Did Steven Gerrard, Martin Skrtel or Daniel Agger have their letter read out to the team? Unfortunately, it wasn't caught on camera this time so we may never know.